District Attorney, Mitch Brockden (Dominic Cooper), goes out one night to celebrate a big victory, and fearing for the safety of his car, in a bad neighborhood, decides to drive home drunk. On the way, he hits a kills a man, running across the street. Another man, Clinton Davis (Samuel L. Jackson) is charged with the crime and it's Brockden's job to prosecute the man accused of committing his crime. Not wanting to convict an innocent man, Brockden blows the case, but afterwards finds out that the wounds on the man he hit, were not consistent with being hit by a car, and match the wounds of seven unsolved homicide victims. Now Brockden must find out if he mistakenly let a serial killer go free. 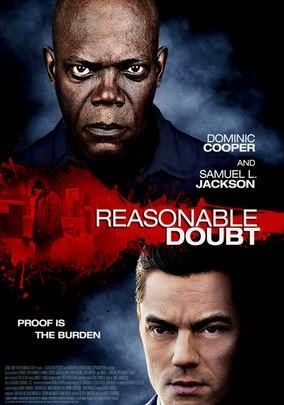 Reasonable Doubt, unlike many similar films, actually had a unique and original story. Both Dominic Cooper and Samuel L. Jackson were terrific, and the film really could have been the hidden gem of the year, but only got 3.5 stars. The reason is simple, while it was a great story, it was far too predictable to be what it could have been. I really it hate when the Writers assume that the audience is too dumb to figure out what's going on. That's what happens here, while the story is tremendous, everything is laid out in such a way, that even a child would know what would happen next. Aside from that, the great story and terrific cast make for an exciting film, that was quite enjoyable, but it was just predictable to a fault.